Outgoing society girl and art patroness Geneva Langley and her husband Nathan are forced to move from Chicago to Seattle because of her scandalous reputation. In Seattle, their lives became entangled with an actress, Beatrice Wilkes, itching to take the leading role at her theatre. Geneva struggles for acceptance in Seattle society, while Beatrice is forced to take on a patron (and basically become a prostitute) to out another backstabbing actress from the lead. 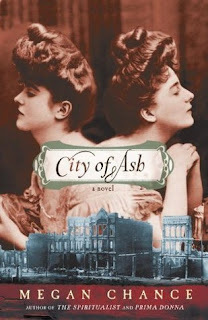 And with the Great Seattle Fire of 1889, everything changes and the two women come together in a common goal. If you overlook the very far-fetched plot and just roll with the unbelievability, this is an entertaining book. I love historical stories and I didn't know anything about the Seattle Fire of 1889, so it was interesting to learn about it as well as the behind-the-scenes lives of theatre workers in the 1880s. The characters were unique and well-rounded for the most part. I liked Sebastian DeWitt and Geneva best. Beatrice and Geneva's plan was far too risky to be believable and I highly doubt it could have all worked so smoothly, but I didn't really care. It was a fun book, like all of Megan Chance's historical fiction. I prefer The Spiritualist and An Inconvenient Wife, but this was good too. Just don't take it too seriously.